As people who stop by here regularly may have figured out, although I frequently agree with criticisms from the left about what is wrong with society, I tend to not agree about the solutions. For example, capitalism results in economic injustice, but we won’t bring about a more just society through a planned economy. The extreme left seems to want to justify and romanticize the actions of the rioters in Baltimore last night. Baltimore is a poor city. It is bleak. There is great economic disparities and great injustices. However, the riots will only serve to exacerbate that injustice. Not only will no good come of it, but bad will come. Many areas of the city already lack basic things like drugstores and grocery stores. Businesses don’t want to open there. There’s a high unemployment rate. When businesses are robbed and set on fire, it makes it even less likely that the new businesses will want to open. That means fewer services and fewer jobs, and the cycle worsens. The rich, the supposed oppressors, felt not one ounce of pain last night. Who was scared last night? Was it someone on an estate far away or someone in a small rowhouse? The cars that were torched probably didn’t belong to the wealthy, and if they did insurance would replace it. Here is an image from The Baltimore Sun of a woman who had to abandon her car at an intersection. There were images of cars at that very same intersection that were set on fire last night. Last night I saw a video of a family that had to flee their burning home. They were, in all likelihood, no wealthier than their neighbors. If the future is uncertain, one thing is clear: it is only through resistance and struggle that a new, more just Baltimore will be born. Another image shows the same young man from the front. It is a credit to the photographer, Algerina Perna, that it is such a compelling image. It is nearly monochromatic. The gray, smoke-filled background. The uniforms of the police officers creates a dark gray horizontal line. With the police slightly out of focus, the viewer’s eye is brought to the young man in sharp focus in the foreground. His red shirt pops out against the grays. Visually, his arm breaks the line of the police officers. His dark fist is prominent against the pale gray of the smoke. It is a strong image of defiance and rebellion. Yet, how much substance is behind that image? Because in the second image we can see him from the front, we see that he is wearing a gas mask. This allows us to identify him as the person in this video. In the video, while the newscaster interviews someone who appears in multiple videos, we see a fire hose hooked up to a fire hydrant in the background. Someone punctures the fire hose. With the camera now focused on the hose, we see a thin young man wearing the same red and gray jersey, wearing the same gas mask, puncture the fire hose. He flees on a bicycle. There is something especially despicable about someone who hampers the efforts of firemen. 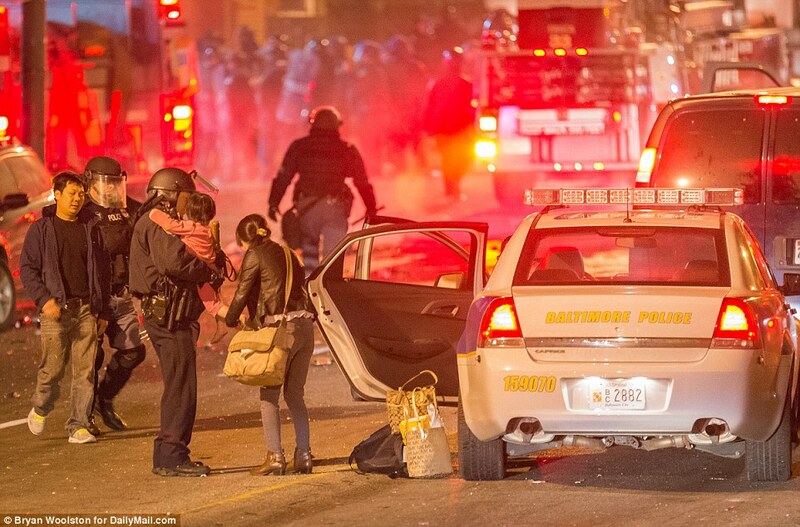 Last night, in Baltimore, there were reports of rioters throwing rocks and bottles at firemen. Later, elsewhere in the city, there was a building under construction that entirely burned to the ground. It was one of the most widely shown images because the fire was so dramatic and the news crews had good footage of it. The building was intending to be a center to provide community services and housing for seniors. A local church had been working on it for eight years. Eight years of work destroyed in one night. Eight years of work by local people for local people. Meanwhile, where were the rich of the area this past weekend? Attending the Maryland Hunt Cup. Frown at the privilege if you like, but recognize that the riots did not have any affect on the people who attended that. It is simply a fantasy that riots and “rebellion” has even the remotest possibility of overturning the established order. However dramatic and compelling the image is, it is just that, an image, and it is a shame that people are seduced by it. Thank you for taking me there. This was a great post. I don’t understand how a sophisticated publication hasn’t snatched you up yet. Your writing is exquisite. I appreciate how you do not jump on bandwagons, but carefully weigh options instead. I may be an atheist, but I am not 100% liberal. I’m certainly not 100% conservative either. Please post an update about you and your city when you can.